Tasks dependencies are the relationships among tasks which determine the order in which activities need to be performed, in other words which tasks are primary and which ones are dependent. 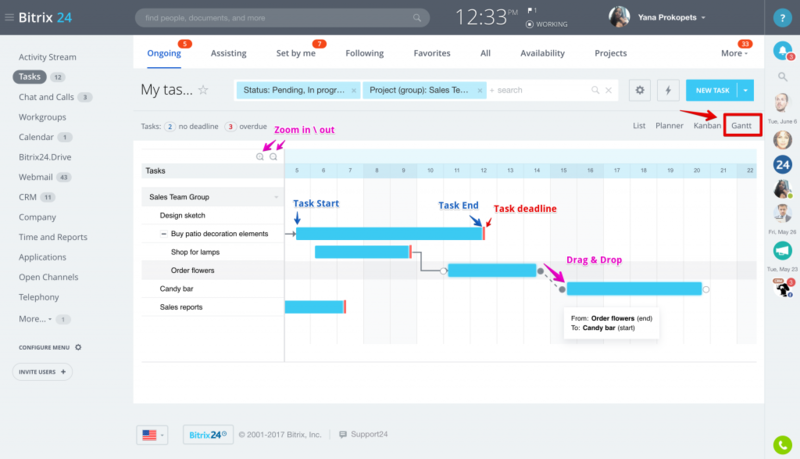 You can set task dependency inside task details form or simply drag & drop dependency line between tasks inside Gantt Chart tasks view. It’s important that you set Start and/or End Dates for your tasks if you want to use dependencies, otherwise Bitrix24 won’t let you create them. Identify the task which deadlines shift influences the other tasks execution. Set dependencies between them. In this case you can shift the dates of the main task and dependent tasks dates will be shifted automatically. If you point the mouse cursor to the task block in the Gantt Chart, you will notice 2 circles by each side of the task - in order to set the dependencies click on one task Start or End Date & drag it (so that a dotted line will appear) to another task Start or End Date. In other words the task which you drag the line from is defined as primary (main) task, and the task which has the line dragged to becomes dependent. If you shift the dates for the main task, the dependent task dates are shifted automatically. But, if you shift the dates of the dependent task - it won't influence the main task dates. Tasks deadlines shift is not connected with dependencies and is performed separately. One task can be connected to several other tasks. In this case the system checks if the new connection influences on the existing dependencies. If the new connection logics conflicts with the existing dependencies, this connection won't be established and you will get the following error: "Circular links are not allowed". Free plan lets you have up to 5 dependencies between tasks. Advanced tasks are available to Bitrix24 commercial plans subscribers.